> Can We Keep Him? It looks like we've got a THEME going on this month, doesn't it? A red, white and blue theme. What's that all about? ​You got it! This month we celebrate Independence Day. July 4th is celebrated with fireworks, parades, and picnics, but it means a lot more than that. A LOT more. It's a big salute to the day in 1776 (240 years ago!) when the Declaration of Independence was signed by our country's forefathers. It was America's way of telling Great Britain, "We don't belong to you any more." It's more complicated than that (a LOT more), but basically it meant that Americans didn't want to pay taxes to or be bossed around by any other country. We wanted to be - you guessed it - INDEPENDENT. And since then we've done our best to take care of ourselves - our land and our citizens - without help or interference from other countries. ​Now that we've got that settled, let's get on with the show here at Wild Heart Mustangs. Why is that? Pets are so much fun. They play and run and make you laugh. Some will even do tricks. They cuddle with you and are always happy to see you come home from school. What’s wrong with that? Well, I’m a grownup, so I have to remind you that pets are live creatures who depend on you for their food, water, attention, exercise, health and safety. Every day. Every minute of every day, day after day. But instead of giving you a long, boring lecture about being a responsible pet owner, I’m going to tell you a story, about Holly the Border Collie. That night we didn’t dare ask our parents where Holly had gone, because we were afraid they’d yell at us. They probably would have. The next day, my dad came into the family room and shut off the television. He sat down with us and told us that Holly had been hit by a car and killed, so she was never coming back. And we would not be getting another dog to replace her, because we hadn’t done a good job taking care of Holly. Dad didn’t yell at us. He didn’t scold. He had tears in his eyes as he gave us this news. After he left the room, my brother and I looked each other in horror and gave in to our own tears. We missed Holly, sure, but we were also ashamed of ourselves. It was a horrible way to learn that animals aren’t toys: something fun to play with and toss aside when you get bored with them. We didn’t get another dog for 5 years. Then Mom brought home a pair of dachshunds that someone else had grown tired of. And then we got the lecture. It felt like it lasted for hours. But we had already learned our lesson, and we took very good care of those dachshunds. They both lived until they were very old and died in their sleep, without the shock and pain of being hit by a car the way Holly had. When I was 8 years old and my brother was 6, we begged and nagged our parents to get us a dog. Finally they agreed to get us one – a Border collie. We named her “Holly” because it rhymed with “collie”. We loved playing with Holly when she was a new puppy, but not so much as she grew older. We left her feeding and care up to our parents even though we’d sworn to help with that. When school was out for the summer we had a lot to do. Swimming, fishing, playing softball. I'm sure you all know what summer vacation is like. Holly would tag along with us. It was hard to keep track of her sometimes because Border Collies are very curious and very busy, but she was smart enough to keep track of us. When we went back to school in the fall, we didn’t have much time for Holly. We were in school all day and then we had homework at night. Holly ran away one autumn day. We’d let her out in the yard, unsupervised because we wanted to stay in and watch an afternoon TV program before we started doing homework. Since Holly was a very active young lady, she went on to investigate the neighborhood, further and further from home. 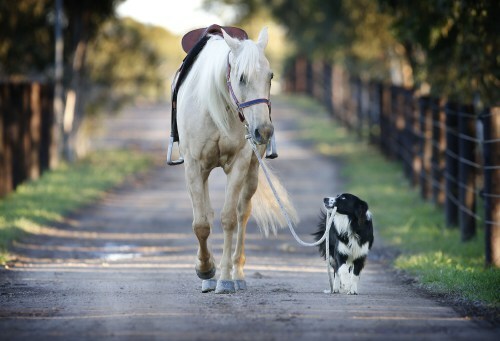 ​Border Collies are called "working dogs". They were originally bred in England and Scotland for herding livestock, especially sheep. Today they’re still used for herding all over the world, doing the job with intelligence and obedience. They don’t just herd sheep nowadays – they also herd cattle. Some people say Border Collies are the smartest of all domestic dogs. They need a lot of physical and mental exercise every single day because they were bred to be workers, not pets. If you don’t keep them busy, they’re sure to get in trouble by digging, biting and chewing anything they can get their mouth around. They do that naughty stuff because they’re bored, not because they’re bad, so it’s up to their humans to give them lots of work and play. When herding cattle, the Border Collie is so tough and so fast that he can keep the big animals moving and avoid getting kicked. A male Border Collie weighs only 40-45 pounds, but he isn’t afraid of animals who weigh 1500 pounds or more. And if you don’t move fast, he’ll try to herd you, too! ​​​To see a Border Collie named Ruabinn moving cattle, watch this video. It’s a long one, but very interesting, and you’ll be amazed by her herding expertise. It’s also interesting to hear the commands Ruabinn’s owner gives her to tell her where to take the cattle: short words like come, stay, here, there, walk, way and away, plus short sounds that aren’t really words but that Ruabinn understands, like “tch” and” tcheo tcheo”. Short commands are the best way to communicate with such a busy, active dog, don’t you think? She’s intent on doing her job and doesn’t have time to listen to long explanations. She’s got these cows to lead, and not all of them are in the mood to cooperate! This Border Collie is jumping 6 feet into the air to catch a Frisbee! That's just a play time stunt. But Border Collies are often trained to do much more challenging things than catching Frisbees, like herding big animals. See how the Border Collie in the photo at the right is all hunkered down and watching those sheep? That means he (or she) is on the job, getting ready to take the sheep wherever they need to go, and with no arguments about it. This collie means business! lives in the state of New South Wales, in Australia...also known as the "land down under." To get a closer look at the map, click on it. ​Most people know that dogs are smart animals. They can be trained to lead the blind, tell deaf people that someone’s knocking on the door, respond to chemical changes within the body and find people during disasters.. They’re more than just “man’s best friend.” They’re our companions and our partners. They’re teammates who help us do our work, just as important in getting the job done as their human partners. 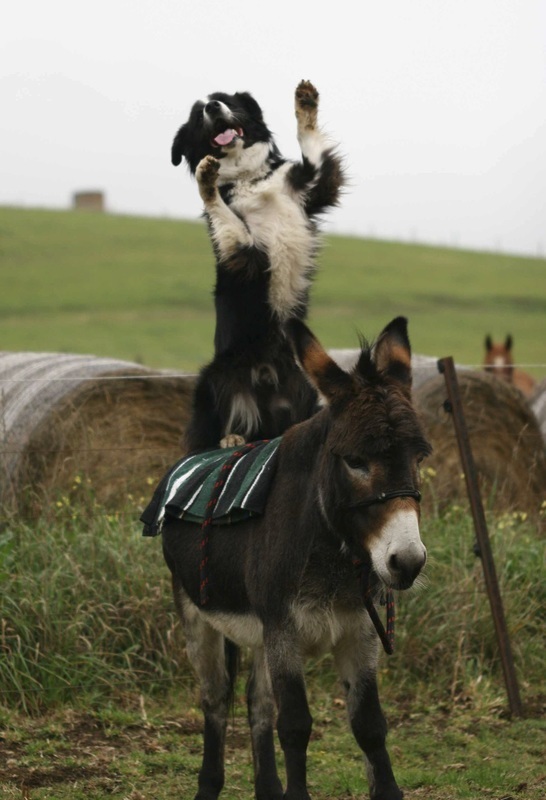 Border Collies are especially smart dogs. A good example of just how smart they can be is a dog named Hekan, who lives in the state of New South Wales, in Australia. His owner, Steve Jefferys, is an equine behavioral expert who runs a training center called Equestrian Excellence. Hekan helps out by holding horses on a lead, taking them for walks, wrangling them if necessary, even riding the horses. Hekan’s name is a shortened version of “HE CAN DO ANYTHING,” and when you watch him in action, it’s easy to see why. He’s willing to give anything a try, and he doesn’t give up. And if “Hekan” do it, “Wekan” too! ​HE CAN DO ANYTHING...including riding horses! In the video below, Hekan works with his pony. Hekan's friend Ukon likes riding Lou-Lou the donkey. Hekan takes Kiko for a ride.